D12 Vario onsen room: 5 spa experiences rolled into one. 5 spa experiences rolled into one. Onsen rooms originated in Japan. Here, onsens are public bathing facilities which use the water from naturally hot springs, engulfing bathers in soft clouds of steam. The D12 Vario replicates this experience and offers numerous health benefits: it increases blood circulation, stimulates the cardiovascular system and metabolism, relaxes and fortifies you, and helps muscles to relax. 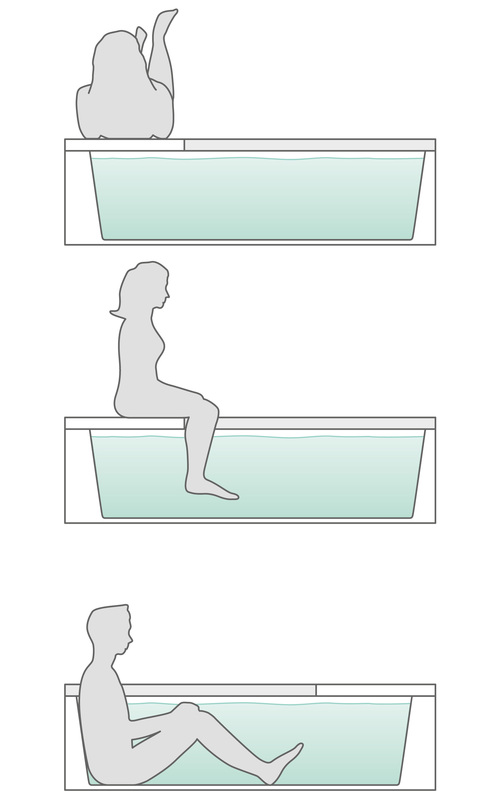 Floating in the warm water also relieves strain on joints. As well as taking a bath, you can also enjoy a steam bath in the D12 Vario. The humid warmth of a steam bath makes you feel healthier and happier – not only during the winter months. And to make the experience even more atmospheric, we’ve fitted a coloured light into the ceiling which bathes the entire D12 in any colour to fit your mood. All you have to do now is choose your favourite fragrance – and voilà, your bathroom is transformed into a spa paradise. The expansive shower above the reclining area offers cold or hot hydrotherapy showers. Three programmes which combine water temperature and volume are available: balancing, stimulating, and relaxing. 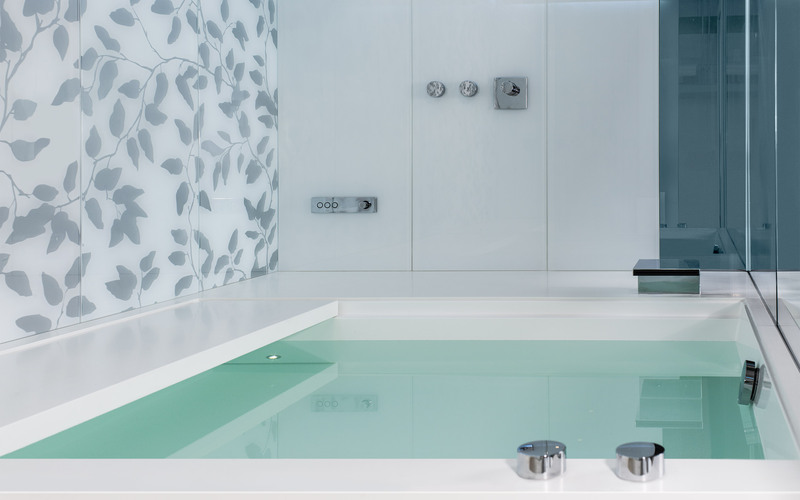 The integrated bath invites guests to soak and relax. The shower is an integral part of any spa, whether it is used to get clean or to cool down after a sauna or steam bath. Not only does the sudden cooling effect invigorate you, but it also causes enlarged blood vessels to contract again. 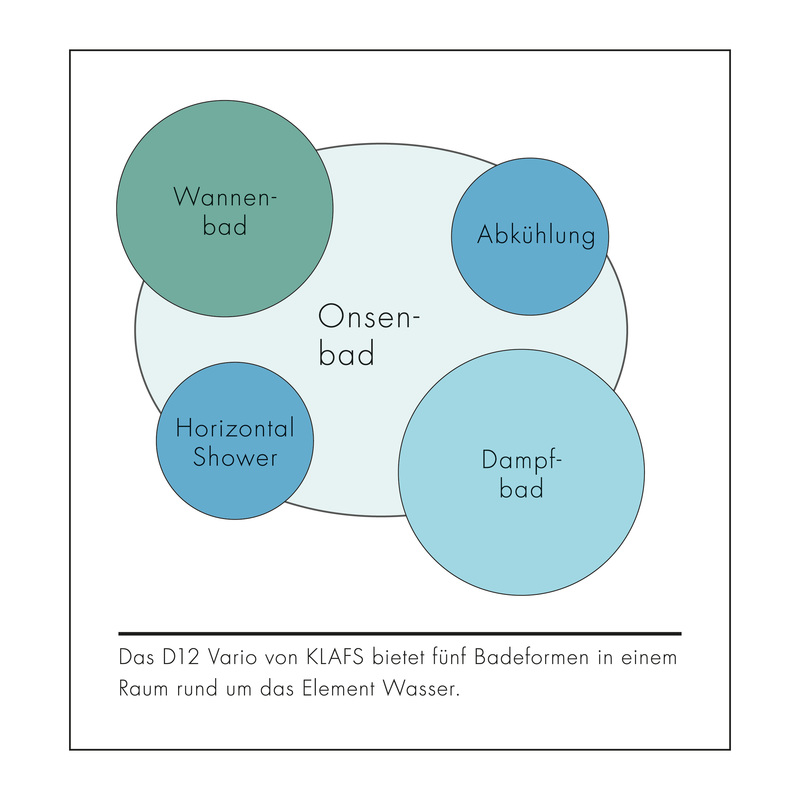 And naturally, you won’t need a separate shower in your bathroom once you have the D12 Vario. The D12 Vario onsen room by KLAFS offers 5 spa experiences rolled into one. A genuine all-rounder when it comes to water. Combination of steam room and bath. The expansive shower area and a second shower offer cold or hot showers. Coloured lights create shifting moods in the D12 Vario. The subtle colours of the Argento Bianco version of the D12 Vario speak for themselves. What makes the D12 Vario onsen room so special? Onsen rooms are the perfect place to bathe, relax and enjoy a steam bath with friends or loved ones. Each guest can choose to either submerge themselves in water or cleanse their skin in the purifying steam. Inspired by the Japanese onsen, bathing here is not only healthy for body and soul, but also gives you the chance to wind down and chat in a relaxed atmosphere. In Japan, people come to onsen rooms after work to relax and enjoy the sensation of refreshment that bathing in hot steam brings in its wake.